I totally just touched my new book: Collected Journalism, out next week! My new book is out next week. It’s a collection of journalism, essays, academic papers, government reports (woo!) and other stuff. 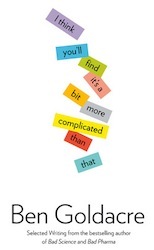 It’s called “I think you’ll find it’s a bit more complicated than that”. A copy just arrived and it is a beautiful, big, thing. The content is all completely different to Bad Science and Bad Pharma, with much more focus on bad behaviour by politicians, journalists, and scientists themselves: some golden gassers from yesteryear, some recent stuff, the odd government report, Susan Greenfield, embarrassing juvenilia, that kind of thing. It’s a fun christmas compendium, an epidemiology and research methods toilet book, if you will. I’ll post the intro and other bits to the blog next week, setting out the shape. For now: I AM EXCITED TO TOUCH MY BOOK. Longstanding readers might remember “I think you’ll find it’s a bit more complicated than that” was a Bad Science t-shirt about 800 million years ago. I’ve just had a look, and these are somehow still available, through an endearing Web 1.0 interface. Their true power is unleashed when you sidle over and stand next to other people wearing slogan t-shirts, for covert photos. “Drop beats not bombs”. “I need a hug”. That kind of thing. This joke took time to grow old. Your mileage may vary. 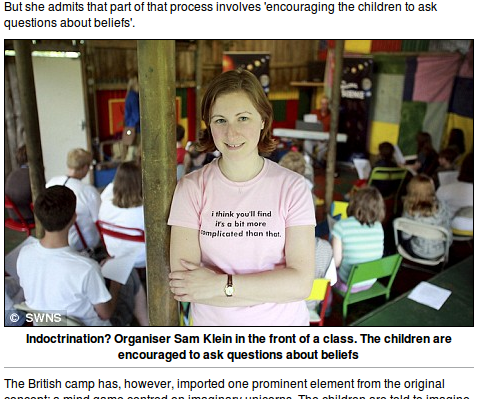 Here is a picture of someone wearing one on the pages of the Daily Mail, in an article about the evils of Atheist Summer Camp. This is almost as good as when the “MMR is safe, tell your friends” baby bib went on display in the Science Museum. Will this be available in the US?